Welcome the latest Super Soco TS and Super Soco TC here at Central Bikes and prepare to experience revolutionary classic design - on a budget. Sleek, fun and 100% emissions-free travel, these battery-powered electric bikes combine style and well-designed practicality to bring you the perfect commuter for inner-city travel. With a maximum speed of 45mph that is restricted to 28mph for UK Moped classification, prepare to beat the traffic in style aboard this revolutionary eco-friendly ride. Available in a range of different colours and styles, the Super Soco comes with a removable battery that can be removed and charged easily on the go. Additional features also include upside down front forks, an adjustable rear monoshock hydraulic, full LED headlights, keyless starting, Anti-theft alarm and a lightweight frame. 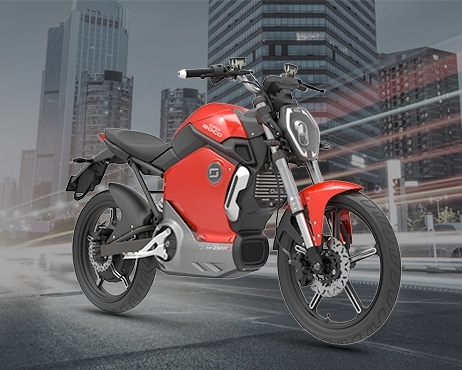 Why not enter the new era of e-mobility today and discover either the Super Soco or Super Soco TC here, or for any further questions, give us a call on 020 7637 0046 at our Charlotte Street branch or on 020 3319 2800 at our Shepherds Bush dealership.